Honda Insight's fuel economy wizard | What Car? 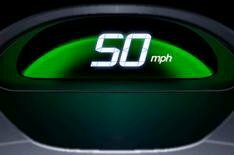 The new Honda Insight will feature a greener driving system to help drivers achieve maximum fuel economy at all times. Called the Ecological Assist System, it is operated by a dashboard button and works in three ways. The engine, gearbox, drivetrain and air-conditioning switch to the most fuel-efficient ways of operating. Drivers are given a rating based on how efficiently they drove each journey, which is added up towards a total score for the lifetime of the car. The scores are represented as a graphic of tree leaves on the dashboard, which grow as fuel economy rises. 'This new package encourages greener, more-efficient driving in a fun and engaging way,' said John Kingston, Honda's Government Affairs and Environment Manager. The petrol-hybrid powered Honda Insight is set to go on sale from next spring, with prices starting from an estimated 15,000.